THE Victoria Derby has been won by some of Australia’s best up-and-coming stayers and a full field of 20 runners will be looking to add their name to the list champions. The $1.5 million Group 1 Victoria Derby is one of the highlights of the Melbourne spring carnival and this Saturday at Flemington one three-year-old will be crowned champion stayer in Victoria. Moonee Valley Vase winner, Sacred Elixir, is the current dominating favourite with the New Zealand-trained gelding bringing the best staying form into the Derby. There are a host of other top chances and bookmakers are offering some great value. We have sorted through the field to find our best winning chances and our best place bet hopes. Place a Double Down bet on the Victoria Derby with William Hill and if your horse doesn’t win, it will refund you your entire stake. Sportsbet is offering $3.10 for Sacred Elixir which is better than the $3 being offered elsewhere. The Tony Pike-trained three-year-old opened at $3.40 at CrownBet, but has been smashed into $3 and the money will likely continue to flow. Swear has been a popular elect since drifting out to double-figure odds. The Hawkes-trained runner opened at $9, drifted to $11, but has since been backed into $9.50 where it has remained steady. The solid support for Sacred Elixir has forced second favourite So Si Bon to drift. It opened at $8 and has moved out steadily to $9.50 at CrownBet.com.au. That’s a good price for a colt which has been targetting the Derby all preparation. Rocketeer has been the big drifter in the market. Despite consistent form this campaign the Mick Price-trained stayer has drifted from $11 to $17, which could be a direct result of drawing barrier 19. We’re not thrilled with the price currently on offer for Sacred Elixir, but it does bring the best form into the race and it should be tough to beat. The New Zealand-trained gelding won the Group 1 J.J. Atkins at Eagle Farm in June and it has looked good this campaign by winning the Guineas Prelude and the Moonee Valley Vase last Saturday. It didn’t get much luck during the run last time out, but it showed its class in the straight by bursting through runners to score an impressive win. Pike is confident he has the right horse to win the Derby and it has pulled up well following its win at Moonee Valley. “We haven’t won the Derby yet but it looks like we are going to get him there and in good form,” Pike said. “The soft track (at Moonee Valley) probably helped and he pulled up in super condition. He has been eating well through the week and is nice and bright. It has the ability to run on all track conditions and receiving the inside barrier draw only makes it harder to beat. Zac Purton comes over to ride at a nice weight of 55.5kg and it should figure in the finish. Take the $3.10 on offer at Sportsbet as we’re expecting that price to drop. The Sydney-based colt won its first two starts before flashing home in the Gloaming Stakes behind Veladero and that indicated that the staying distances would be its calling. That again showed true when it ran Cox Plate placegetter Yankee Rose to within a half-length in the Group 1 Spring Champion Stakes at Randwick. Its effort for second was indicative of a three-year-old which could handle the Derby distance and the odds are appealing. $9.50 for the win is a solid each way price, but the $3 to place at CrownBet could be the way to go. The So You Think colt has won only one race from six starts, but it has been looking out for this distance after running on well throughout this campaign. It finished off well behind Sacred Elixir in the Guineas Prelude and it didn’t get a clear shot at them in the Caulfield Guineas when it ran fifth behind Divine Prophet. It again settled midfield before producing a nice finish in the Moonee Valley Vase when third and the rise in distance to 2500m will suit perfectly. Some horses don’t make the transition from 2000m to 2500m, but So Si Bon looks likely to cope. It also has Hugh Bowman in the saddle who won the Derby aboard Lion Tamer in 2010, Sangster in 2011 and the Robbie Laing-trained Polanski in 2013. That’s a great record and Bowman believes he has chosen the right runner for this year’s Derby. “He looked good in the Guineas, ran well in the Vase and the winner of that race is the favourite,” Bowman said. “I’m hoping he’s got the right form – history says he has, but only time will tell. So Si Bon looks a great each way chance at $9 with William Hill and it should figure in the finish. If Anaheim makes the field it could be a big danger. The Fastnet Rock colt won its maiden at Ballarat last Monday and although this is a big step up in only six days time, it’s worth a chance at $51 with CrownBet. 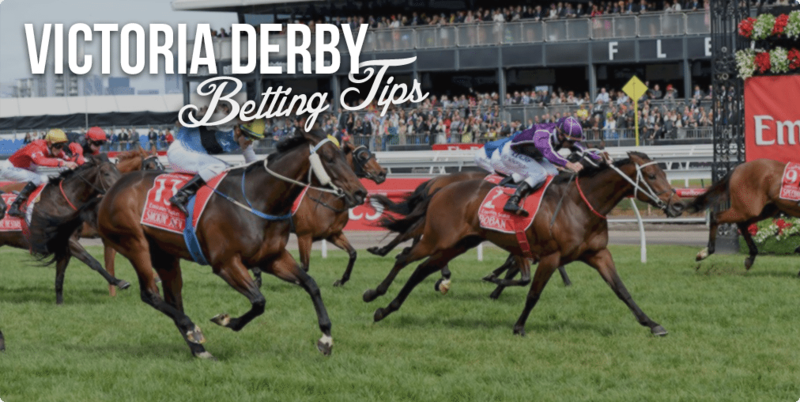 It has Zabeel lines in its breeding and its trainers are confident it will see out the distance, so if there are a couple of scratchings in the Victoria Derby, include Anaheim in your selections at the big odds.